In the summertime, many of us venture into the great outdoors as a way to enjoy nature and escape the pressures of everyday life. For many, camping is the perfect mixture of comfort and adventure. You have some of the amenities of home, but there’s also an opportunity to experience nature up-close and personal. A weekend of camping offers a fantastic opportunity to relax, recharge and gain a whole new perspective on life. Of course, as with everything in life, there’s a chance that things can go wrong during your trip. You always want to hope for the best, but prepare for the worst. Here are some of the worst-case camping scenarios and how to handle – or maybe even prevent! – them so they don’t ruin your trip. Local police/park ranger phone number for the area you’ll be staying. Address of the campground or park entrance address. Camp confirmation number and campground phone number. 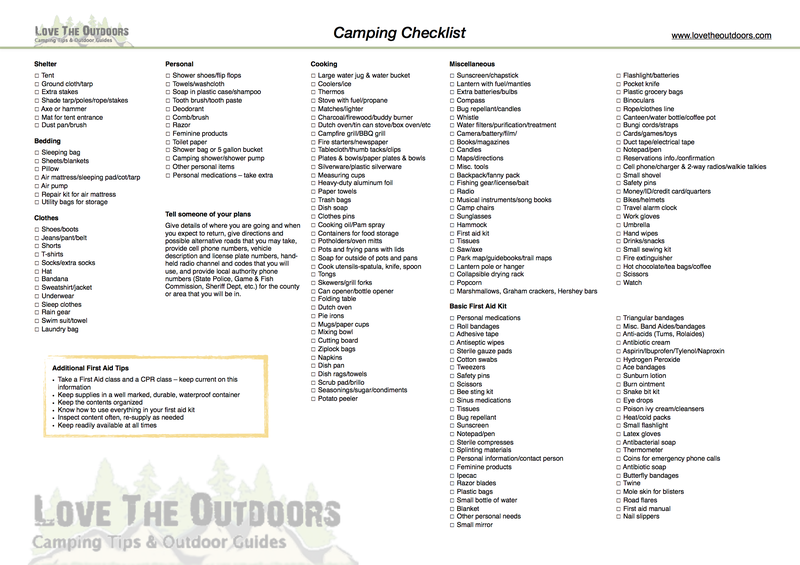 This checklist features the basics for a camping trip. You’re sure to need more, so keep expanding it as you see fit, or you could use the Camping Checklist from Love the Outdoors. Now that you have the basics of your camping adventure covered, let’s look at some of the issues that may arise during your weekend (or week!) in the outdoors. A bear sighting is enough to scare anyone! Just remember that bears are motivated by two primary needs: Getting food and protecting their young. Bears that show up in campsites are looking for food, and humans are not typical prey for bears. Beyond bears, you may also accidentally attract the attention of other wildlife, including possums, raccoons, coyotes and skunks. To avoid them, store your food in airtight containers and keep all food and cooking waste sealed in another container. A campfire will also tend to keep these animals away from a campsite. The presence of a dog may also keep them from coming close. If you actually find one of these animals invading your campsite, make loud noises to drive them away and shine a flashlight on them. These animals prefer to operate when it’s quiet and under the cover of darkness, removing either of these conditions is often enough to trigger their flight response. It’s easy to get lost in the wilderness, and the consequences can be deadly. The best bet is to never travel any distance from your campsite without a partner. If you have kids, give them whistles to wear around their necks to make it easier for you to find them in case they wander off. A cell phone can be a lifesaver — assuming you’re in an area where you have cell service. Program all applicable emergency phone numbers into your phone before heading out and keep your phone turned off to conserve battery life. Carrying along signal flares can also help you alert rescuers to your location in the event that you can’t get a cell signal or you’re out of whistle-hearing range. If you’re truly lost, try to locate a man-made object – such as a cabin, access road, power line or trail marker. Stay by it and wait for help to come along. When you come across a boulder or other large object, mark it with chalk or scratch it with another rock. Leave a message that says you’ve passed by and need help. Finally, if you know how to use a compass, always have one with you to help you orient yourself. A campfire can transform into a wildfire quickly. If this occurs, you have two choices – to evacuate immediately or try to contain it. In both cases, be sure to contact the local authorities as soon as it is safe to do so. Only try to contain it if you feel you can manage it on your own. To do so, smother it with shovels full of dirt or with soaking, wet towels. If you’re near a stream or other water source, fill buckets or containers with water and throw the water on the perimeter of the fire. Move tents and other objects away from the flames. If you realize the situation is getting out of hand, evacuate and call the park office or a fire department. You can limit the chances of a fire breaking out in the first place by applying the following campfire safety tips, including clearing the area of flammable material and limiting ember release. Sometimes the problems with camping don’t come from nature, but from the neighbors in a nearby campsite. They may play music too loud, let their dog run wild, have obnoxious kids, be drinking alcohol and smoking or staying up much later than you. To avoid these conflicts, try surveying a potential campsite before you set up – Is it secluded? Do the current neighbors raise any alarm bells in your head? Can you expect a decent amount of privacy? If your neighbors are raising a ruckus, walk over to their camp and strike up a conversation with them. Let them know what your plans are for the rest of the time you’re there. This conversation should be enough for them to get the hint and respect the communal nature of the campground. If all else fails, contact the park ranger or campground management and ask them to speak with the other campers. They may just remind the offenders of camp quiet-time hours and other rules, which should be enough to change the problem behavior. Unfortunately, camping isn’t an entirely safe endeavor, especially when other people are around. Thieves can sneak into your campsite when you’re away and steal food, gear, bicycles and other equipment. Vandals can roll through and wreck your site. Aggressive or intoxicated individuals may simply enter your campsite just to start trouble. To limit the opportunities for such negative behavior, lock up all items when you’re away from site, always have one person stay in camp or camp close to others. When securing your site, don’t forget to lock windows and doors, chain bicycles and equipment and keep your camp tidy so you can immediately recognize that something has occurred. Further, keep the park and emergency phone numbers available so you can contact authorities immediately. There are a number of ways people can become injured or sick when camping — slipping on wet rocks, drinking contaminated water, fire burns and insect bites are just a few examples. Prepare for emergencies by learning basic first aid techniques, including CPR, before you leave home. Bring a fully supplied first aid kit along with you and call the emergency number (or set off a flare) if the situation appears serious. If the situation is beyond your ability, don’t hesitate to contact the park office or emergency services. If you’re in a hard-to-reach area, there could be a considerable delay before they reach you, so alerting them early is always the best-case scenario. Sometimes, despite your best intentions, you forget some important element of your camping gear. Maybe it’s a tent stake, hiking boots, sunscreen or even paddles for your canoe. Whatever you’re missing, the first place to visit is the nearest 24-7 convenience store or, if you’re lucky, the campground supply store on site. You may be able to scrounge up the vital missing element you’re after. If that’s not working, check with campers at nearby sites. They may have spares or something you can use in place of what you’re lacking. If you’re missing some item for a meal, such as ketchup or even a package of hamburger buns, you’ll find your fellow campers especially generous! If all else fails, then dig deep into the supplies listed in the checklist we posted at the beginning of this article – you’ve got rope, twine, duct tape and implements to cut them with. Try creating what you need with these plus the natural items you’ve got around you. A simple tree limb that’s shored up with lots of duct tape could provide a serviceable tent pole, for instance! Yikes! Bad planning or even a raid by a hungry animal may leave you without food for your whole camping trip. If that happens to you, the best bet is to make a quick trip to a nearby grocery or convenience store. If that’s not possible, campers from another group are sure to take pity on you and invite you over for a meal. You can also break into your emergency supply of snacks, but if you do, make sure to replenish them when you get home. A swarm of mosquitoes or other flying pests can quickly ruin a fun camping trip. If mosquitoes have invaded your campsite, light citronella candles. If you have any electric fans on site, turn them on (mosquitoes cannot fly well in breezy conditions). Also, try sticking close to the campfire – mosquitoes will avoid excessive heat and smoke when possible. Your best bet, however is to apply DEET-based mosquito repellent spray. Apply it to all exposed skin and on any clothing that mosquitoes might try to bite through. Another option, particularly if you’re going to be camping on site for more than a weekend (or own the property or a campground business), is to set up a Mosquito Magnet® CO2 mosquito trap. When properly placed, these traps will draw mosquitoes away from your campsite and to the trap. More importantly, a CO2 trap from Mosquito Magnet® can offer protection from mosquitoes for up to 1 acre around the trap! That’s more than enough space to make a great campsite. By following the guidelines above, you should be well-prepared for unexpected situations at your campsite or campground. Remember, what makes camping such a great experience is that you’re there to enjoy the best of what nature has to offer. That’s why you also have to be proactive and limit the risks. Setting up a Mosquito Magnet® CO2 trap is one such example. If you have a trap up-and-running at your camp ahead of time, you’ll be eliminating the mosquitoes that will come after you during your stay. To learn the more about these mosquito traps, visit Mosquito Magnet® on Facebook and subscribe to the Mosquito Magnet® E-Newsletter, which provides you links to helpful articles like this one as well as announcements from Mosquito Magnet®.